Greetings, one and all! I hope everyone had a fantastic Thanksgiving, and got some time to do some sewing! I know I keep disappearing, but it is my strong hope that perhaps, in the near future, my life will reach the point of controlled chaos in which I can find the time, motivation, and decent photography to post with reasonable frequency. Before I get back into talking about things I’ve made, though, I figured I owed it to y’all to explain the reason I’ve been “gone” for so long – my husband and I bought a house! We signed the paperwork back in June – actually, is was literally the day I got back from San Francisco! – and so moving in and getting settled has taken some time. I also took on several major unselfish sewing projects upon my return, which included two wedding gifts, a bridesmaid dress, and five dance costumes, so it’s been a while since I’ve had the chance to sew for myself! I finally have my own sewing room in the form of a finished attic, which is a dream come true, but I’ve also realized that this requires me to get organized and actually be intentional about my sewing space. Currently, most of my fabric stash is laid out on the floor in piles separated by fabric type; in a way, it’s a sort of visual representation of the organized chaos that is my life at the moment. So….I have a ways to go! This need to get organized has resulted in a bit of sewing paralysis. Since I can finally see my stash in its entirety, I want to find the “perfect” garment for each piece, which these days tends to mean I spend my free time puttering with fabric possibilities instead of doing any actually sewing. To attempt to remedy this, I got myself a copy of the Colette Sewing Planner, which is really helping me get my thoughts in order. Instead of just sewing individual garments in isolation, I finally feel like I have a cohesive wardrobe plan (or, at least, the beginnings on one). It all started with the yarn. I noticed a gorgeous cashmere yarn at Twill one day, and knew I had to have it. There were only four skeins for each color, so I picked my favorite and hoped it would be enough for a cropped sweater. 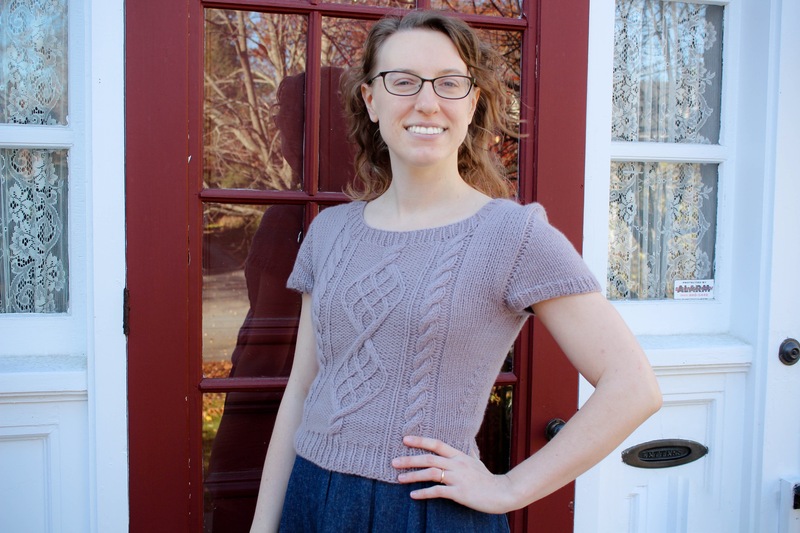 I chose Andi Satterlund’s Chuck sweater, which I had been wanting the make again ever since I knitted it the first time. I figured I could always make it with short sleeves if I ran out of yarn. I made a size XS this time, since Andy’s patterns are usually a bit big through the shoulders when I make a small. I’m definitely happy with that change – the shoulder “seam” sits much closer to where I like it than the last iteration. As you can see, I did end up having to shorten the sleeves. In fact, at the very end, I was so short on yarn that I had to take out the bottom few rows of ribbing and use that to finish the sleeves. I just barely made it – whew!! Oh, and that front door? It’s *my* front door, y’all! Woot! 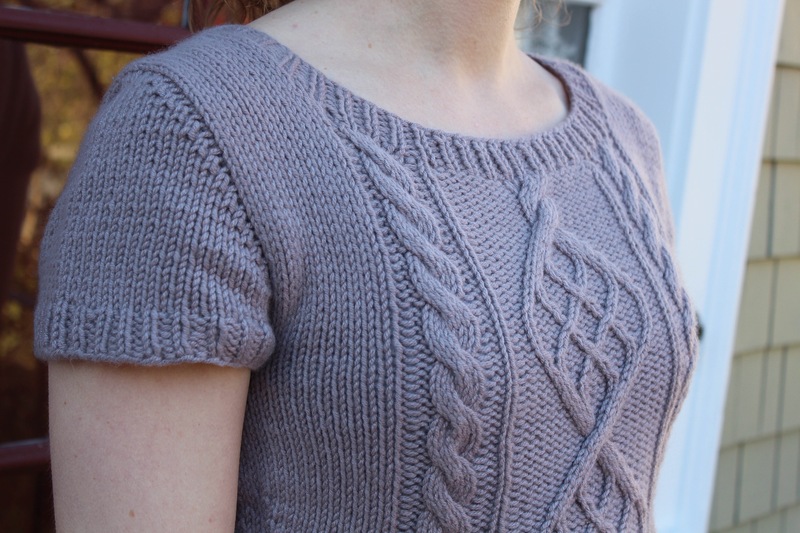 I’m mostly pleased with the sweater, though I have noticed that the sleeve and neckline ribbing are beginning to stretch out a little. Apparently cashmere has less elasticity than wool, so it’s not “bouncing back” like I’m used to. I’m wondering about threading some elastic thread through the wrong side of the ribbing to give it a stronger recovery. 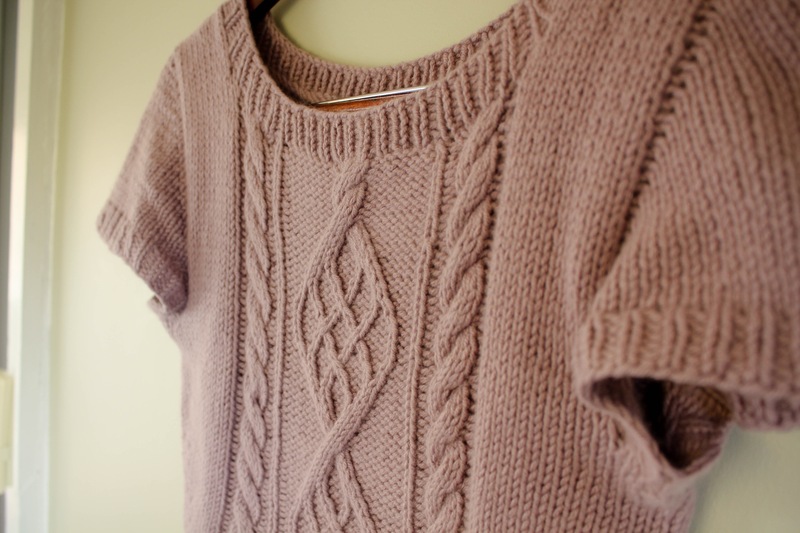 These pictures were taken by a lovely friend of mine who is both a fantastic knitter and a wonderful photographer. She doesn’t have her own website yet (just a personal facebook page, which I’m not comfortable posting here), but as soon as she does, I’ll post the link, since I’d love to get her name out there! Thanks, Viktoryia! Such a perfect and original version of Chuck, I love it! Also your tension is amazingly even. Thank you! 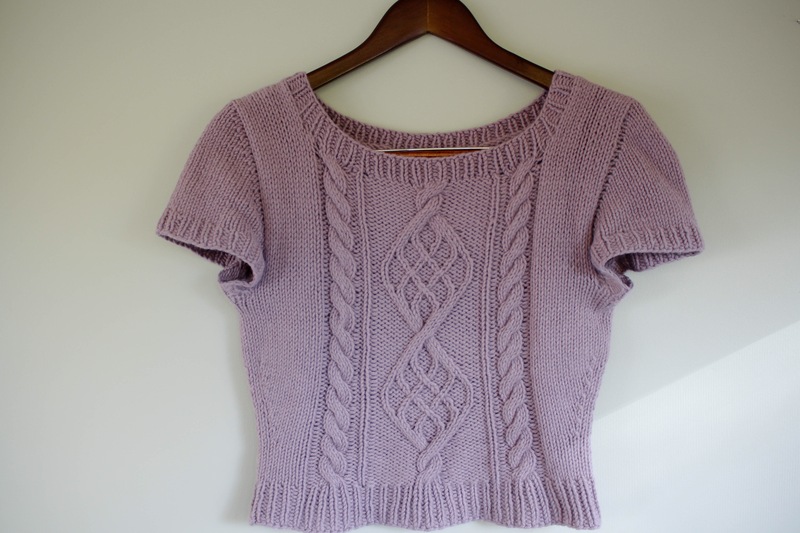 Using natural fibers and blocking help to even out the tension – it definitely looks better post-blocking! Nice top! I don’t knit so I always find knitting amazing! Congratulations on the house and Oh How Lovely to have your own sewing space!